In the September 2016 issue of The Fan Hitch, there was a tribute to Siu-Ling Han’s life and work in Nunavut. Siu-Ling was a remarkable person and she had an impact on many people in the territory, the city of Iqaluit where she lived, and in her work with Environment Canada and the Canadian Wildlife Service. Her passing from cancer in August 2016 was felt deeply by so many people, not least of these her friends in dog-teaming communities across Nunavut. 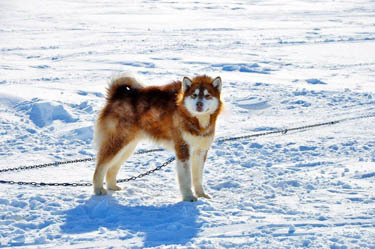 Siu-Ling was a passionate qimuksiqti (musher, or ‘dog teamer’ in the Inuit language). She raised and trained Inuit Dogs starting in 1999 after getting her first dogs: Atsuli, Aiviq and Fiddich from Paul Crowley and Lynn Peplinski, long time dog teamers in Iqaluit. 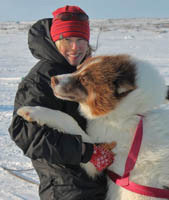 Siu-Ling travelled regularly with her dogs in the Iqaluit area and had several races and long-haul adventures over the years. Her dogs were the centre of her life and she worked hard to make sure that her dogs were healthy, happy and lived and worked in a way that honoured the traditions of Inuit culture. She was an inspiration to many of us who have Inuit Dogs. 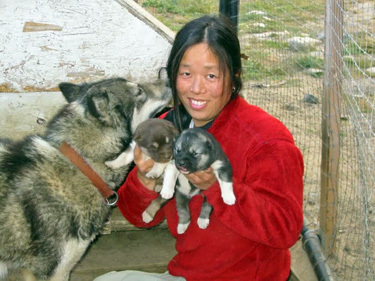 One of Siu-Ling’s big trips with her dogs was in 2009, when she travelled up the east coast of Baffin Island with three other women (Matty McNair, Connie Maley, and Debbie McAllister) from Qikiqtarjuaq to Pond Inlet, over 1000 km. But for many of her friends some of the smaller trips were just as memorable. I remember the calm beauty of going out with Siu-Ling and her dogs for a quick day trip on Frobisher Bay one spring, on a beautiful blue-sky day. I remember the connection I could feel between Siu-Ling and her dogs. As we hooked up and took off there was a little of the usual chaos in launching a dog team, but it was obvious that the dogs respected Siu-Ling. Trotting along on the ice, Lewis, her lead dog, would listen and (mostly) respond to her commands. What stood out most during the run, during a relaxed break for tea and when we put the dogs back in their dog yard, was that every single dog looked at Siu-Ling with that unmistakable look – love. I suppose it is no surprise that Siu-Ling mastered cursing as part of dog teaming, as she did all other aspects of it. She put great effort into her team, from well socializing her puppies (even sending them to Ottawa to be handled by beloved nieces) to ensuring that retirees lived out their last years in the care of family or friends – somewhere where they could have a well-deserved life of luxury. Individual dogs were all important to her. They were her family and she cared for each one with great love and respect. Names like Toko, Rode, Adam, Lewis, Karhu, Tua, Lillian, Bedford, Gigi, Giller and more stand out because she talked of them like she would talk about any family member. Siu-Ling’s dogs and their descendants continue to run on the ice in Iqaluit and beyond, now in the care of good friends and other qimuksiqtiit. Two of the dogs I am running now, Q and M, are the grandsons of Gigi. When I watch them run, I think of Siu-Ling, and I smile. I know all of us who knew and loved Siu-Ling carry a piece of her with us on our sleds, every time. Note: In addition to being a skilled qimuksiqti, Siu-Ling was a talented singer-songwriter. With friends she produced a CD, To Those Who Would Show Kindness. All proceeds from sales of the CD go to support mental health programs and projects for Nunavut youth. You can order the CD or download the album here. Read more about Siu-Ling and her music in the CBC News North, Nunatsiaq News and the Northern News Services Online. Dr. Shari Fox Gearheard is a geographer and research scientist with the National Snow and Ice Data Center (NSIDC) at the University of Colorado Boulder. She is also part of the staff of Piqqusilirivvik, Nunavut’s Inuit Cultural School. Since 1995, Gearheard has been working with Inuit communities in Nunavut on research projects that bring together Inuit Elders and hunters with visiting scientists to study Arctic environmental change. Gearheard is originally from Ontario, Canada, and has been based full time in the community of Clyde River, Nunavut (telecommuting to her university) since 2004. For over ten years she and her husband Jake have had a team of Inuit Dogs. They have travelled thousands of kilometres with their dogs around Baffin Island and competed in five Nunavut Quest races.